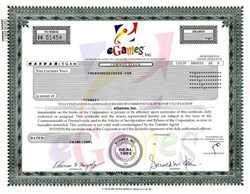 Beautifully engraved issued and uncancelled certificate from eGames, Inc. issued in 2001. This historic document was printed by the Columbia Financial Printing, Co. and has an ornate border around it with a vignette of the company's logo. This item has the printed signatures of the Company’s President, Gerald W. Klein and Controller, Thomas W. Murphy, and is over 10 years old. eGames, Inc. (OTCBB: EGAM) is a software publisher and developer for casual and traditional computer games based in Langhorne, PA.
DSG was originally called Dikit Suso Gang when it went public in 1996. The public company was formed by a merger between a software sales company (Romtech) and one of the first educational multi-media CD-ROM development companies called Applied Optical Media based in West Chester, PA. Soon after going public, Romtech acquired a software development company based in San Luis Obispo, CA that created SOHO software, and also shut down operations at Applied Optical Media. The eGames website provides registration and technical support. 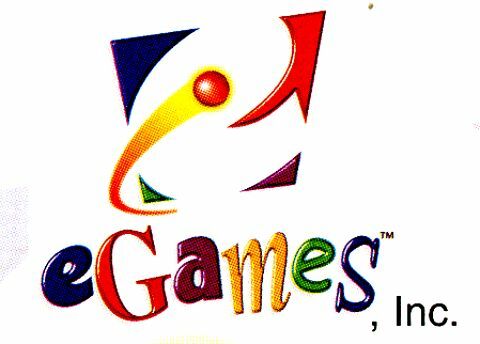 In late 2005, eGames acquired Cinemaware, a game company founded in the eighties who produced a series of "interactive movie" games including widely-acclaimed Defender of the Crown. In 2006, eGames released the first titles under its new affiliated label, Cinemaware Marquee. Through Cinemaware Marquee, eGames brings traditional games developed around the world to retail. Cinemaware Marquee titles include Space Rangers 2: Rise of the Dominators, Independent Game Festival grand prize winner Darwinia, and Moscow to Berlin: Red Siege. eGames recently announced that it would be reviving many of the classic Cinemaware titles, beginning with Defender of the Crown.